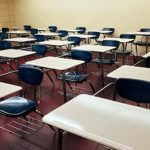 Albany – Today, the NYS Education Department released guidelines about the substantial equivalency of instructions that nonpublic schools are required to provide. The guidelines acknowledge that religious schools are different than public schools, but require all religious schools to teach the same courses as the local public schools, and do devote the same amount of time to those subjects. 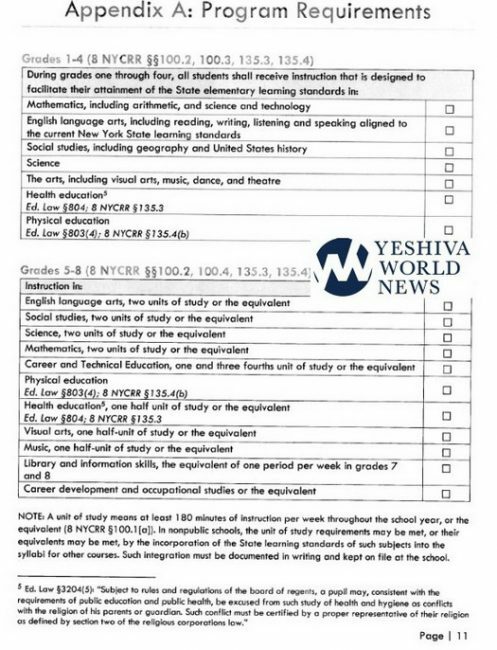 The new instructions, accompanied by tool kits and checklists, leaves very little flexibility for what yeshiva elementary schools can teach. For grades 1-4, it mandates instructions in 7 subjects at an attainment level similar to state standards for public schools. For grades 5-8, it requires 11 subjects, with strict time requirements for most of these subjects. Adding up all of the subjects and time requirements, a yeshiva will have to devote more than six hours every day, five days a week to secular studies. It further requires school districts to review all religious schools over the next two and a half years, and then to reinspect all of the schools over the subsequent five years. The new guidelines state that if a school is found to be non-equivalent, parents will be given 30-45 days to transfer their children to a different school. After 30-45 days, the school will be defunded and the parents will be in violation of the truancy laws. Does that mean that yeshivas will now depend on the whims of bureaucrats in school districts all across New York State to understand the benefits and skills derived from limudei kodesh? A few years ago, a different New York City leader attempted to force us to tamper with our mesorah by attempting to regulate bris milah. The frum community got together, and the Agudah, Satmar, Chabad and numerous mohelim sued to block the government intrusion into our core religious practices. In its decision in favor of the lawsuit, the court observed that the City appeared to be biased against religious practice, because it regulated bris milah but ignored other instances where there were supposedly public health concerns. That lead the court to conclude that what bothered the City was frum practice, not public health. With the City and State attempting to intrude on our yeshiva system, perhaps it is time to point out that the educational system we are supposed to be substantially equivalent to – the public school system – is a failure and has been a failure for decades. That raises the same question the court asked the City about bris milah – are you really concerned about education, or are you just bothered by religious education. All those who care about our yeshivas should demand an answer to that question. what would the rebbe say!!! We should demand a proper education. This includes English and math. Are you one of those that fight whatever is dear to Rebbe. I happen to agree that limudeo koidesh was dear to our rebbe, but let’s not forget that the rebbe had many things dear to him, witch majority of the moidois in our neighborhood completely overlook. in fact they even go directly against them at times (for example not excepting bochurim in yeshiva with no exceptable excuse). Its a shame that people only think about the rebbe in our moisdois when it comes to issues like this, but totally overlook the fact that they are the rebbes moisdois and belong to the community, not to the roshei yeshivos/menahalim etc. And should run how the rebbe wanted it and not the egotistic management that occupy out moisdois today. About time yeshiva students will learn English and basic math. There is nothing treif about English and math. I wanted to share the following reprinted paragraph from “The Economist” magazine which provides facts and data to a growing problem. We need to get a reality check. In the hospital every new mother is given a brochure against metzitza bpeh. Yes the lawsuits did block the government intrusion into a bris Milan however it goes not stop the health department from continuing to share the risks. Ny state court of appeals threw out the case against Kaporos. For those of you who don’t know this is the highest court in New York State. There are Shuls and communities that had Kaporos with chickens in the past that still refused to have Kaporos with chickens. When this legislation will continue into paw We need to register every single child for public school. The city will need to provide schooling. What will the city do? There are not another 160,000 seats for all the kids in public schools. 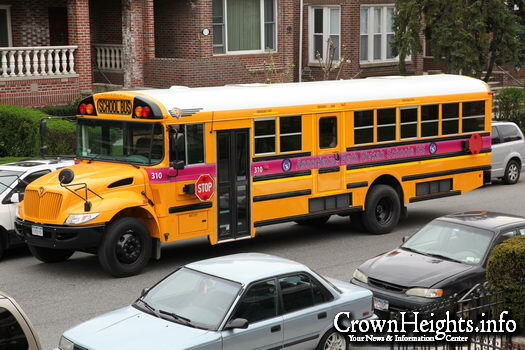 The DOE will rent the Yeshivas classroom. We will gain. Before and after school will be lemudei kodesh. Yes davening will be at home. And the city will go bust. Our powder is in our numbers. dual curriculum schools don’t have adequate funding for the 4 hours it does teach secular subjects. According to the title of this article only, not any of its contents, i understand that NYC would like nonpublic schools to have 5-6 hours of English studies. Our Jewish schools will most probably not want to cut an hour from Hebrew studies, so they may add an hour to the school day. I’m not saying this will definitely happen, nor am i suggesting it, it is just a possible outcome of this new ‘guideline’. Students, even secular studies-loving ones, will, I am very sure, be extremely unhappy at that turn of events. It wouldn’t help the amount of time children spend at home with their families either. Although it may not happen, there is always a possibility. Any other result of this new rule would probably do as much harm. Hey wait, i missed that… WHAT did you say was so good about this new ‘GUIDELINE’? If this wasn’t so obviously a gzera min hashomayim I would advise the Yeshivas to grant life experience degrees in African American studies or other poorly regulated fields and then just be a graduate school. First our children will be taught how to write and count and before we know it they will be doing drugs and marrying shiksas. Rethought previous comment: Just taana the absolute truth. We don’t want our young people to engage in the abhorrent practise of “cultural assimilation”. From our point of view, Chanukah and all that. This is the Chanukah story playing over and over. Another challenge for the Jewish community to crush. Too bad lot’s of money will be wasted fighting this. In the past we were moser nefesh for Torah, today we just need to dig deep in out pockets, so be it. For those who want their kids to have this or that education. Guess what? You have options, plenty of options out there. Send your kids to a different school if your not happy here. Don’t force your way of life on to us. I send my kid to our schools for what they are (or aren’t). If you don’t like it, you are welcomed to go elsewhere. Find the product that fits you best, leave us alone. 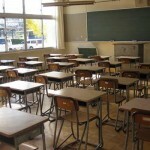 70% of public school kids are failing (nationwide). They can’t do it right, yet they have demands from us? I demand the the schools teach my child swimming, art, sports, self defense, baking, automotive, sea sailing, piloting etc….all the things that have gotten the Jewish people to where we are today. And some of that Torah stuff, not too much. What we did was more informal, since the yeshivas still could focus only on limudei kodesh. Maybe yeshivah parents can get permission to homeschool their children, and then send them to self-sustaining (meaning: no government money!) yeshivas that teach only limudei kodesh. This would be sort of like “Hebrew School” in reverse, in that most of the boys’ time would still be in yeshivah and then a smaller amount of time would be spent after school learning secular studies at home. The parents can individually use whatever secular studies materials they approve of. In homeschooling, there does not appear to be a timing requirement (yet). If our schools were to go back to not looking to government for ANY funding, we’d have total freedom to teach what and how we wish: pure and holy. It’s complicated, but not unheard-of. There are a few non-Jewish religious universities that take not a penny from any government entity, and they have a reputation for producing excellent scholars. If not, how is it that THEY are getting away with it? If we taught a reasonable amount of secular studies an hour or two, the government would never have started this. Now they want 6 hours a day. Our kids are smart enough to learn in an hour or so a day what public school kid takes days. My kids were educated out of town, learned secular studies and excelled in schools in Crown Heights. Too late for so many young men. Note that every time it says “units” it says “or the equivalent”, and in the text on the bottom it defines equivalency. Yes, a unit is 3 hours per week, but if a yeshiva covers all the points in the syllabus in less time, it’s in the clear. Even the health ed material has a religious escape clause. Rather than panic, read the requirements. They seem quite reasonable. The “only” problem we will likely hit is the schools (like Chabad’s) that teach hashkafos in which Big Bang theory, Inflation, Old Earth Geology, evolution etc… are prohibited.